Photography to me is similar to meditation. 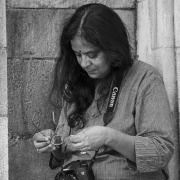 I am immersed in thought and find myself in a trance like state when there is a camera in my hand. While I thoroughly enjoy capturing geometrical shapes and architectural brilliance, I am absolutely thrilled by photographing people and their varied emotions. The best thing about photos are their ability to take us back in time and remind us of good times that can help us get back on track with life. Sonali Dalal, who is from Ahmedabad, has an educational qualification of B.Com, L.L.B, DTP. This creative lawyer has a keen eye not only for justice but also for symmetryr. Her works dwell upon abstract, realistic abstracts and candid portraits .Her love for pictures has lead her straight into the world of photography where the concept of time ceases and she has all the freedom to shoot whoever she wants, with her camera of course. She has won the Gold Medal for her photograph 'Curious' at The 73rd Photographic Salon of Japan in 2012. She specializes in candid and abstract photography and is always eager to experiment. Her photographs have been displayed in 2 solo shows and several group shows since 2010.